Peace is scarce. Peace - that is, tranquility, harmony, serenity, stillness, calmness - it is a rare thing in most of our lives. On the contrary, tension and turmoil, anger and agitation, fear and worry are often ever-present aspects of our days. There is strife in our politics, bullies in our schools, catastrophes in creation, cancer in our bodies, and worries in the workplace. Even when that which disrupts our peace is not that upfront or outright, we still have to reckon with everyday busyness. We have to-do lists that keep getting longer, schedules that are increasingly packed, and demands that keep demanding to be met. Look around and you will find a people “on-the-go.” Running from here to there. Multi-tasking at all times. Connected in all instances. Physically in one place, while their hearts and heads are somewhere else. The coffee shop where I grab my daily “joe” has a parking lot that is literally an accident waiting to happen. Traffic is allowed to go both ways even though there is only enough room for one car to pass. The drive-through blindly shoots out where people enter and exit the building. The turns in and out of the parking lot are too tight for most cars. All of which makes getting a cup of coffee a much more exciting escapade than it need be. This morning the perils of the parking lot were on full display. I pulled in while a car in the drive-through was pulling out. Meanwhile, a customer was entering the store. The customer was caught between us. I saw him and stopped. The other driver did not. Luckily, he saw her. He waited until she drove by and then entered the crosswalk. As he passed behind her car, she remained oblivious to his presence. He was irked. When my kids are behaving badly I jokingly inform my wife that they (our daughters) are hers. Needless to say, she doesn’t think it is as funny as I do. “They’re yours too,” she reminds me each time with a blissful tone in her voice and a stinging look in her eye. “They’re yours too.” At which point I realize that I cannot avoid doing something with them – about them – for them. 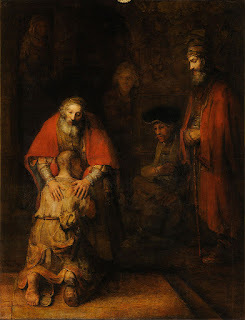 There’s a story in scripture traditionally labeled “The Prodigal Son.” It is the story of two sons. The elder son is faithful, obedient, hard working and patient. The younger son, well, not so much. He’s brash and demanding. He insists on his half of the inheritance far before it is due and then squanders it in dissolute living. I played the part of a leper today. My daughter, Delaney, is quite ill. Her illness is not hidden from the world. She coughs. She cries. She wheezes. She sneezes. She has the classic kid snot-face with swollen eyes and a smoker’s cough. She sick. And today we were shunned like lepers. In the doctor’s office parents chose to stand in a corner rather than sit within 20 feet of us. Those who were seated nearby got up and moved across the room. While picking up her scrip from the pharmacy the associate looked at us with pity and despair. Now, I don’t blame people for their reaction, but I’d be lying if I said it didn’t hurt to see my daughter avoided and shunned.